To be appreciated for what you love to do is to feel as if you’ve been kissed by both sides of the sun. Recently, two fellow bloggers nominated me for separate awards: Best Moment Award and the Sunshine Award. My apologies to both for a long overdue, but heartfelt, thank you. Now I feel like I am in the Sunshine and this is my Best Moment. I know what a slacker I’ve been, so I will leave it up to my nominees to follow thru – or not – as they see fit. No hard feelings. Favorite non-alcoholic drink: Does such a thing exist? Prefer Facebook or Twitter? Neither. Prefer face-to-face communication. Pardon the very long post and my procrastination. These creative bloggers all do an excellent job in entertaining, informing and amazing us with their stories, illustrations and photos. You’re welcome. You were a natural choice, Sue. I do enjoy your writings, your photos, and Ani’s shenanigans. You’re welcome, Arindam. Your poems and writings are inspiring. It does feel good to be part of such a wonderfully creative community. Congratulations and thanks, all in one go, Judy! What a lovely title for an award – Best Moment. It struck me immediately…. You’re welcome, Kate. You really do enlighten and entertain in your posts. So many hit home. Thanks Mom, and Congratulations to you! I do love your stories as well. Thank you … thank you. Loved your Dr. Who story, Jenn. Congrats on the awards, Judy!…well deserved too! 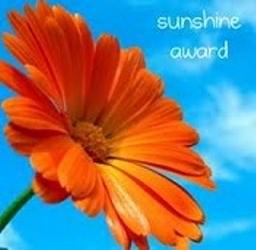 Thanks you for nominating me for the sunshine award…I’m honored. Thank you, Deb. Your artwork is outstanding and your stories have a delightful, unexpected ending. Congratulations, Judy, on two well deserved awards! Thank you, Paprika. Coming from someone whose writing I admire, that means a lot. Congrats on the well-deserved awards. By the way my favourite flower is also poppy. Thank you, Lidiya. I love your philosophy on minimalism – getting rid of the clutter. I grew some poppies when we lived in New York, but it’s too hot In Florida to raise them. Congratulations, Judy! I loved your opening line. Your readers offered you some lovely, beautifully written compliments and rightly so. Your writing is inspiring, humorous, and heartfelt. Though we’ve never met, your posts exude such genuineness that after I read them I feel as though I want to hug you. I’ve enjoyed being part of a shared community with you. 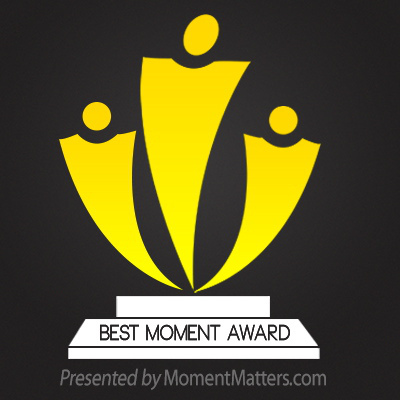 Thank you for honoring me with the Best Moment Award. I truly appreciate it. Awww, Lisa, that is so sweet. Thank you. Your award is well deserved. Your stories often leave me laughing. You definitely have inspired me to hone my craft. The opening line, while I’d love to take full credit for it, is a paraphrase of David Viscott’s quote: “To love and be loved is to feel the sun from both sides.” I just love that quote. Lucky, lucky you. We were in Paris for six days and it just went by so fast. There is so much to see, and my husband and eldest daughter were determined we’d see every bit of it. We must have walked for MILES each day. Great time with the family. Congratulations! Very well deserved! You have shared with us some wonderful stories! Thanks for thinking of me too. Thank you, Kate. I look forward to your posts as I have so enjoyed your experiences at work and at home – informing and entertaining. I’m so happy for you receiving this award, you totally deserve it! Thank you, CultFit. I enjoy your blog as well. Thank you, Judy, but I already have received the Sunshine Award, and I’m sure there are others deserving this. Your blog inspires, informs and entertains me. I look forward to each new post. Thank you for the compliment and for nominating me for the Best Moment Award. I also look forward to reading your posts. They really do touch my heart. Your posts are like sunshine’s warmth and joy to all of us. Congratulations. Thanks for sharing these awards. You made my day…awesome! You’re welcome and you’re very kind. Island Traveler, I love your stories and photos.